Sekiro: Shadows Die Twice is an action adventure game developed by FromSoftware and published by Activision. Sekiro: Shadows Die Twice was first revealed at The Game Awards in 2017 with a short teaser trailer as FromSoftware’s next project. Though no title for the game was revealed, the teaser was accompanied with the words “Shadows Die Twice”. This was not originally planned to be part of the game’s name, and was meant to be used only as a slogan, but was included in the final title by FromSoftware’s at Activision’s request. The game was revealed in full at E3 2018. FromSoftware partnered with Activision for the publishing of Sekiro: Shadows Die Twice. Though the developer was given full creative freedom over the project, Activision were responsible for input and guidance in things such as user accessibility and tutorials, which were aspects FromSoftware wanted to improve in Sekiro as compared to previous titles. 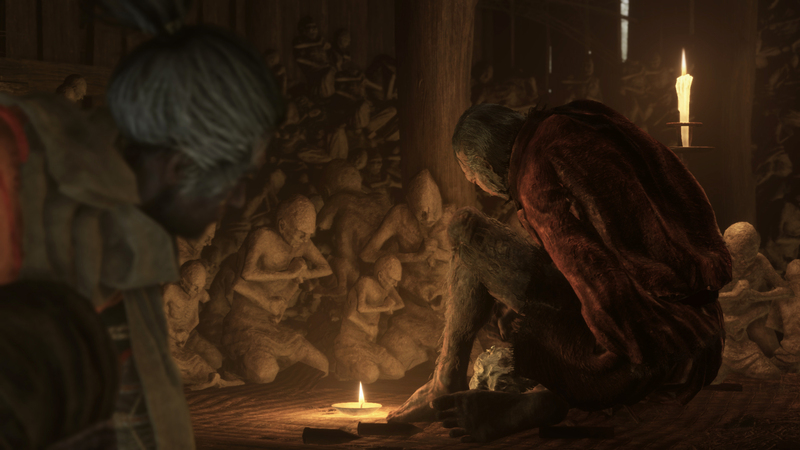 Development on Sekiro: Shadows Die Twice began in 2015 when Bloodborne’s expansion pack, The Old Hunter had been released. In the initial stages of development, FromSoftware envisioned Sekiro as a game in the Tenchu series, but as development on the project progressed, they decided to turn it into a new IP. 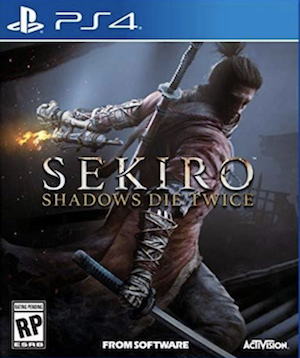 Sekiro: Shadows Die Twice takes place in Sengoku era Japan, but though it is set in a historical setting, it does not feature any real historical locations, events, or figures. Players take control of a shinobi, who is left for dead in an attack by the Ashina clan. The shinobi’s arm is severed, and the lord he serves is kidnapped. Upon reawakening, he discovers his severed arm has been replaced by a prosthetic by a mysterious old busshi, who dubs him “Sekiro”, which means “one-armed wolf”. The game follows Sekiro’s story as he sets out for revenge against the samurai of the Ashina clan, and to rescue his kidnapped lord. Sekiro: Shadows Die Twice is an action adventure title that differs from FromSoftware’s previous Souls games (including Bloodborne) in several ways. There are no multiplayer elements in the game, with the studio choosing to focus solely on single player mechanics, while the game also doesn’t have many role-playing elements seen in the Souls series, with the focus instead being on action combat. 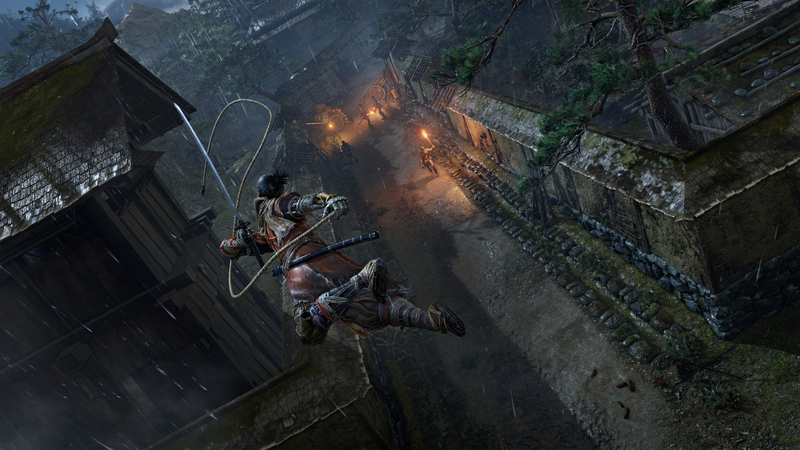 Where dodge rolling is an important mechanic in Souls, Sekiro’s faster and more immediate combat instead places a focus on parrying, with the combat system revolving around combatants clashing swords and looking for openings to strike their opponents. The mechanic of using Souls as a currency and returning to spots where the player had been previously killed to retain these Souls is also not retained. Progression is instead handled through different mechanics. Players get experience points that fills up a meter, which then awards skill points, which can be invested to upgrade particular skills in a skill tree at locations known as Sculptor Idols, which function similarly to bonfires in Souls games. The skill tree has three branches- one branch focuses on sword combat (the samurai tree), one focuses on stealth (the shinobi tree), while the third branch focuses on upgrades for the main character’s prosthetic arm. The prosthetic arm can be upgraded and installed with different things such as a giant axe, or the ability to shoot shuriken. Players also collect items known as prayer beads, which can be used to upgrade the health and posture stats. 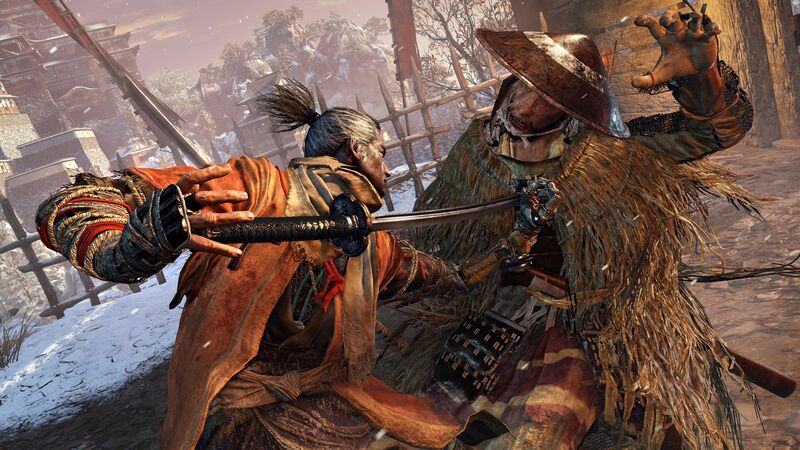 Though there are no corpse runs, Sekiro will still punish players for dying in other ways. Additionally, if the player dies at any point, they have the option to be revived at that exact location under certain conditions, instead of respawning back at the last checkpoint. According to FromSoftware, this element will be used as part of strategizing in combat, but will also involve penalties so that it cannot be overused. Sekiro: Shadows Die Twice also places a larger emphasis on stealth. Players can hide in tall grass and utilize stealth in other ways to pick off enemies in arenas one by one in order to bring their numbers down before taking them head on. While employing stealth, players can also overhear conversations between enemies, which might yield information that can be used by the player later on, such as a particular weakness a specific kind of enemy type has that can be exploited. The game also has greater traversal and mobility options as compared to previous FromSoftware titles. Using the grappling hook in the main character’s prosthetic arm, players can grapple immediately to rooftops or perch points, which can be used to survey combat arenas, or to pick out enemies. According to FromSoftware, the new traversal options also add dynamism to boss fights, and have to be accounted for in such encounters. Boss fights also revolve around the parry mechanics as players look for an opening in their opponent’s poise, rather than giving the enemy a health bar which has to be whittled down with attacks. The game also places a larger focus on exploration, with the developers stating that areas in the game are more open ended and allow greater freedom to go in different directions, especially as players progress further and further into the game. Though Sekiro: Shadows Die Twice employs several new mechanics that set it apart from FromSoftware’s Souls titles, the developer has ensured that the game will retain their challenging nature. Similar to the Souls title, there will also be incentive to play through the campaign repeatedly, and the campaign will get progressively more difficult with each repeat playthrough. Unlike Souls, however, Sekiro: Shadows Die Twice will have “friendlier” tutorials which will explain the mechanics and the systems of the game properly and make it easier to learn and pick up. Sekiro: Shadows Die Twice will also feature multiple endings, with how the story concludes varying depending on the actions players take while playing the game. Unlike Souls, the endings in Sekiro will be more intrinsically related to the story, which itself is a much more focused and direct narrative experience. Another byproduct of that fact is that the game does not have a character creation system, since its story focuses on a particular character as the protagonist. The game will be similar to Dark Souls 3 and Bloodborne in terms of size and length.